Open Europe: New figures show that 51.4% of UK goods exports are sent outside the EU and we run an EU trade deficit – does that tell us anything? New figures show that 51.4% of UK goods exports are sent outside the EU and we run an EU trade deficit – does that tell us anything? New trade figures out today show the UK exports more goods to countries outside the EU than to countries inside EU. But what is the relevance of this or the fact that the UK continues to run a trade deficit with the EU? As the graph below shows, the UK has for most of recent history sent far more than 50% of its total goods exports to the EU. The UK's services trade is more diversified but it is a traditional argument that the EU's customs union is vital to the UK's goods exports. 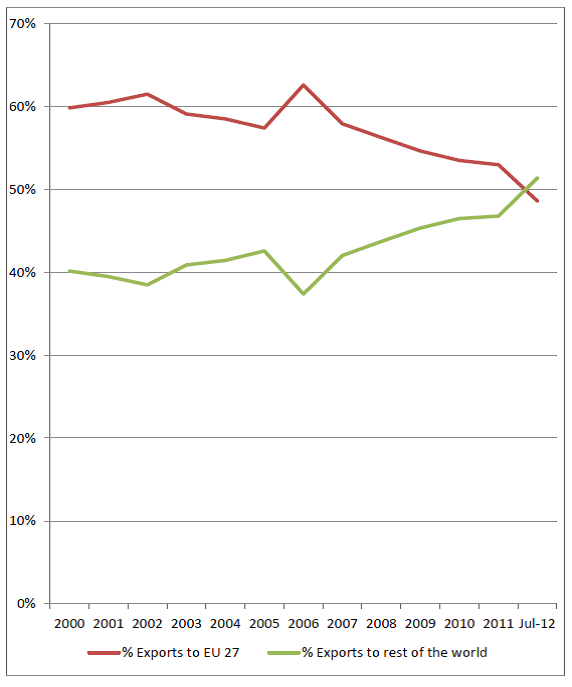 The recent figures for July 2012 seem to buck the trend due to weak EU export and better non-EU export figures. As an aside, the proportion of UK goods exports going to eurozone countries fell to 43.6%, the lowest share since records began in 1988. The simple answer is no. 50% is a rather arbitrary figure;** it would make little difference if the UK only exported 40% to the EU - it would still be vital to ensure it continued, although it could be argued that the less the UK relies on the EU for its exports the stronger its hand politcally. But the more important question for now is whether the UK’s membership of the EU is the best way to promote trade and if so whether this benefit is offset by the other costs of membership (budget, regulation, CAP, etc). 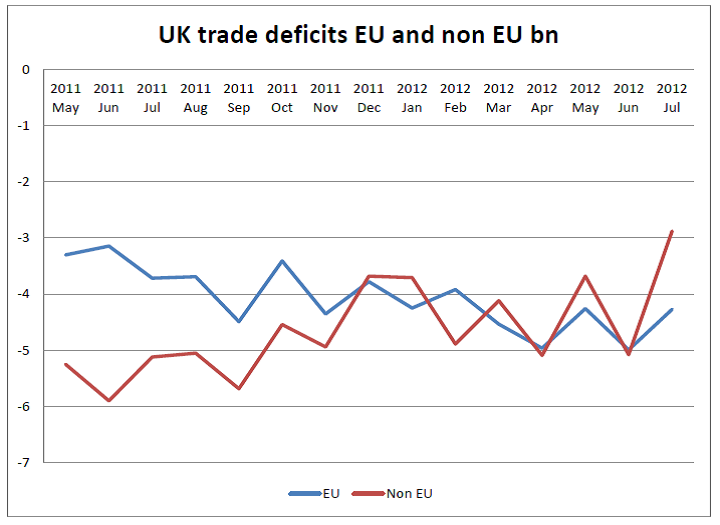 Is the UK’s trade deficit with the EU a strong card to play if we left the EU? The second potentially significant trade figure out today shows a UK trade deficit with the EU in goods of £4.3bn - bigger than that for non-EU goods. However, the UK's record in goods also needs to be considered along with its more healthy balance in services trade, but even when services are included the UK still posts a total trade deficit with the EU. So is it a strong card? If the UK left the EU would it be able to strike a deal that preserves the UK’s trading relations with the rump EU without the costs? One argument goes that its deficit is a ‘trump card’ that will force the remaining EU to conclude a favourable Free Trade Agreement (FTA). 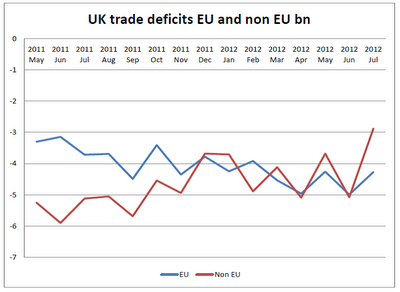 Yes the UK has a deficit but what is more important is total volume of trade. For the UK total EU trade is now less than 50% of its exports. Less than it was, but for the EU (ex UK) the UK would amount to only 22% of its total exports (E306bn out of E1,348bn) – who has the upper hand? Clearly for the EU 22% of its total exports is a lesser consideration than the UK's 50%. Striking a trade deal should be mutually beneficial, but things are seldom that clear and, given recent hostility to UK financial services exports, the comparitively weaker UK position could be significant. Does the UK’s membership of the EU discourage its trade outside the EU? Mostly no, although the future is less certain. The UK’s non EU trade is governed by the EU’s Common Commercial policy which includes the EU's network of free trade agreements and its seat at the WTO. In outsourcing its foreign trade policy to the EU, the UK is trading off its specific negotiating requirements against the weight of a common negotiating position, backed by the incentive of the Single Market. The EU has a reasonably good record in pursuing liberal trade deals, where its combined weight helps, however sometimes UK priorities (services) get subsumed to others' priorities. One area where being in the EU does not help UK trade is the protectionism surrounding agriculture, where the UK on its own would probably chose to import cheaper products from outside the EU than currently allowed. What is the best way to increase UK trade? In our recent paper “Trading Places” we looked at the operation of the EU from the perspective of UK trade and concluded that it was currently working. Not at as well as one might like, but still working. However the outlook may change; the benefits of the Single Market may not be increased due to problems implementing further liberalisation in services and the EU may lapse into protectionism in its external policy leading to less favourable trade deals for the UK that stop it benefiting from growth markets for its services. But, of course, UK membership of the EU includes other membership costs (EU Budget, CAP, regulation etc.) so in order to ensure that EU membership remains beneficial for the UK, the Government needs to reduce these costs as well as increasing the benefits where possible. Given that the UK, with mixed success and too different degrees, has been pursuing a liberal trade agenda in the EU for some time and the caveats noted above, this is no longer enough to ensure the benefits will continue to outwiegh the costs over the long term. The Government therefore needs to do far more to reduce the cost side of the equation, which requires the renegotiation of the UK's terms of membership. ** We accept that the UK’s trade to the EU is inflated by both the ‘Rotterdam Effect’ and import displacement particularly as a result of the CAP. 1. As you say 50% doesnot mean a thing. However the trend is right, diversification of markets especially if your largest market looks pretty dodgy for the future. 2. Not agree on the relative position towards each other. Looks more like a Mexican stand off to me. It hardly matters if you end up dead with 2 or 5 bullets in your head. Mutual assured destruction. Main point it at this stage the EU cannot afford a tradewar with the UK. First it will show the thEUter company is falling apart, what will do them a lot of damage with their Euro-rescue. Second a big hit in their exports will bring their economy certainly in recession and a long term one. hich makes an Eurorescue even more illusive as it already is. 3. As said several times earlier this is the moment to start up a reneg. The UK is much more likley to win this or get a good deal compared to when everything is quiet on the Brussels front. 4. Points imho simple maths, just what brings you the most financial and economic benefit. But you need a proper analysis and inventory for that, it should be finished asap and also look at secundary effects. 5. Reducing the UKs position to a pure Common market one, might even be benificial for the whole of the EU. It is now of course completely ridiculous that there is not a European patent and people like Rollo can not sell their stuff effectively in France while the EU gets involved in protecting of wolves, original forests and other nonsense like annual cartests. It is becoming simply an extra layer of government more than a free common market (and it looked like there was already too much government). The EU simply also needs lower government costs (not only on EU level) to pay for rising healtcare and aging costs and remain to be competitive (as at least half of it is simply not. 6. Getting out structure funds and agricultural policies seems a good thing. Ineffective use of money anyway and especially for the UK. 7. Productstandards. Need probably a complete revision. If there is an incident there is often costly new legislation. It is hardly ever checked if the costs make any sense. Kick that Lux woman back in her doghouse. No more new legislation(=red tape) until the economy is back in order. Just to mention a few things. Are we forgetting the 9 billion quid a year we pay in, and thats after our rebate. What I would like to know is just why are we in and what do we really get out of it, answer, billions in and nothing out, simple. Don't forget that this trade balance includes the trade that we ship worldwide through Antwerp, Rotterdam and so on, all of which is counted as exports from here to UK. The real value of our export trade to the UK is less than 40% of our total and our exports are 10% of our trade. So exports to EU are 4% of our trade. But even on that small figure, we make 4 BILLION POUNDS PER MONTH TRADE DEFICIT (19 billion import, 15 Billion export to EU. EU trade is a huge loss-making disaster. Why do British Exporters ship through Antwerp and Rotterdam? Because there are so many empty trucks going back across the channel. The trucking companies will take a load for less than the cost of the ferry, to cut their losses or improve their profits, instead of going back empty. Why would they go back empty? Because of the huge trade deficit we have with the EU. It only shows the fact that the EU is in deeper trouble than ever. While we continue to be able to buy their tomatoes and other comestibles they can't buy our whisky and gin as before. Therefore the rise in the percentage of our exports OUTSIDE the EU could merely be the reciprocal of falling exports to the EU.